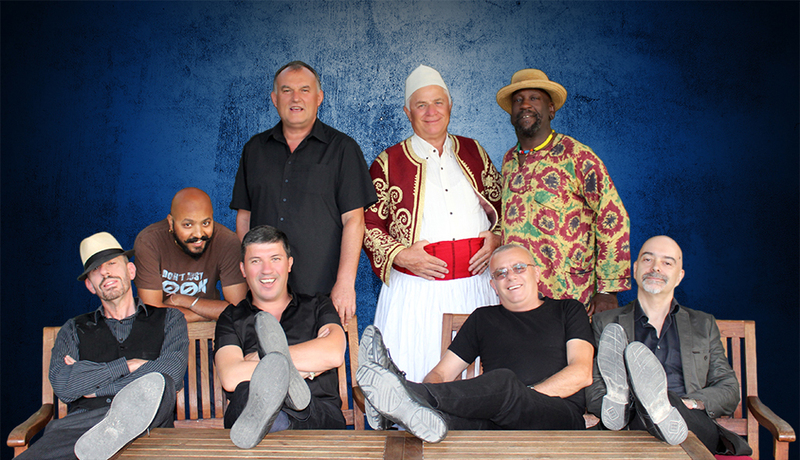 When the British group Transglobal Underground joined up with the Albanian brass musicians of Fanfara Tirana in 2013 the world was faced with a musical feast of unknown quantity! The exchange of ideas, texts and melodies between the electronically oriented Brits and the gang from Balkan led to a fantastic celebration of life, the ocean and love. Everything told with the utmost respect of the musical roots while still focusing clearly on the future. Two distinctly different musical projects came together, and it soon turned out that the mix of reggae and electronica mixed with South Albanian kaba and isopolyphony was explosive. Some of the magic was caught on the record Kabatronic that was released in 2013 and quickly became both an audience and critics favourite. The project played many of the greatest festivals in the world and the album won a number of international awards all over the world. “Best World Beat Album” and “Best Music Video” at the IMA 2014 (Independent Music Award, US) and was nominated for best world music album at the Grammy Awards the same year. We’re taking the Balkan Party to a new level at Dokkhuset Friday October 5th!